Yeah, you read that header right. This isn't just Batman atop a giant Robot dinosaur mount, said robot dinosaur mount eats criminals and stores them in its belly jail cell. I... I don't know what to say. It's a giant robot T-Rex. This cannot be stated enough. 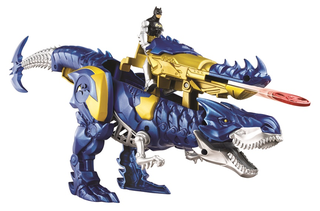 Batman thought a giant robot dinosaur would be an effective method of transport in Gotham. None of his infinitely more practical bat-vehicles could cut it. And yet, there's a commitment to the Batman brand here. The blue/silver/yellow colour scheme echoes iconic Batman colour palettes of the past, and then there's the Bat-branding on the legs and most importantly, the batarang-shaped tail of the dino. Not content with a mere robot dino mount, Batman installed an apparently retractable disc-shooting cannon in its back. Has Bruce Wayne gone batshit crazy? I hope so, because I love it. Batman's a sort of 'no killing' sort of guy most of the time, but there's something deeply weird about using his Robo-dino to eat criminals, depositing them into the holding cell that is the robot's stomach. That's just kind of dickish to put someone through, Bats, criminal or otherwise. There's no price or release date for the CybeRex just yet, but it is referred to in press materials as being seen in the Unlimited cartoon series, so at least that means soon there'll be actual animated shenanigans with Batman and his robot dinosaur jail beast.